The SK Wyverns and KIA tigers have announced a trade that will send pitchers Song Eun-Beom and Sin Seung-Hyeon from SK to KIA. 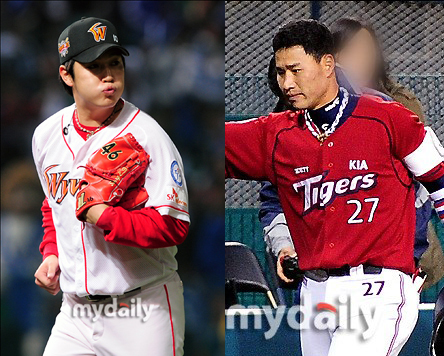 While SK will receive outfielder Kim Sang-Hyeon and pitcher Jin Hae-Su from KIA in the deal. Song was a local favorite for SK, having grown up in Incheon and played his entire professional career for the Wyverns. Similar things could be said about Kim, who grew up in Gunsan and started his career with the Tigers, although he spent several years with LG, before returning to KIA. Kim earned the 2009 KBO MVP award when he hit .315 and lead the league with 36 homeruns and 127 RBI. He hasn't put up the same sort of numbers since then, but he should still provide SK with a right-handed offensive weapon. Song, on the other hand, is expected to strengthen KIA's bullpen as they try to hold on to the top spot in the league.